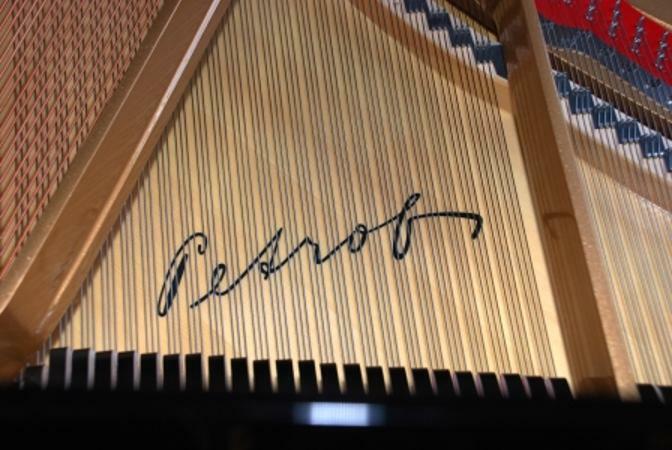 The photo above shows the soundboard of a very nice new Petrof grand piano. Bright, clean and attractive. 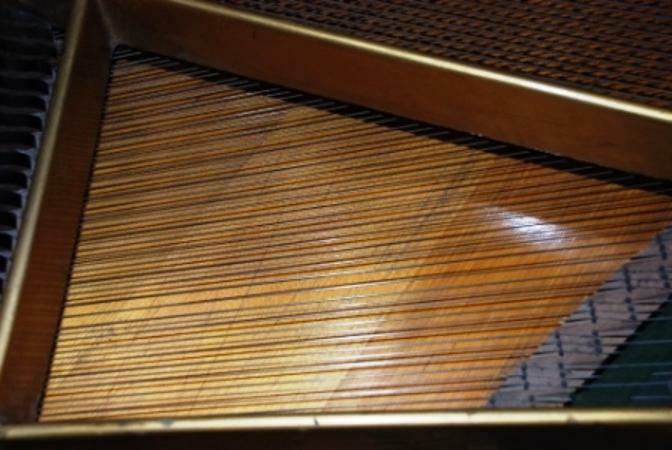 Since a grand piano's soundboard is horizontal, it stands to reason that if the piano lid is kept open, dust and grime will accumulate over time. 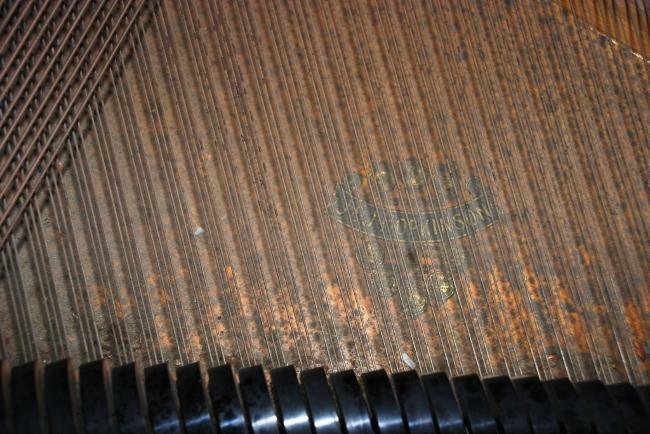 Here's a photo of a small 1930s Allison grand piano - pretty grubby! 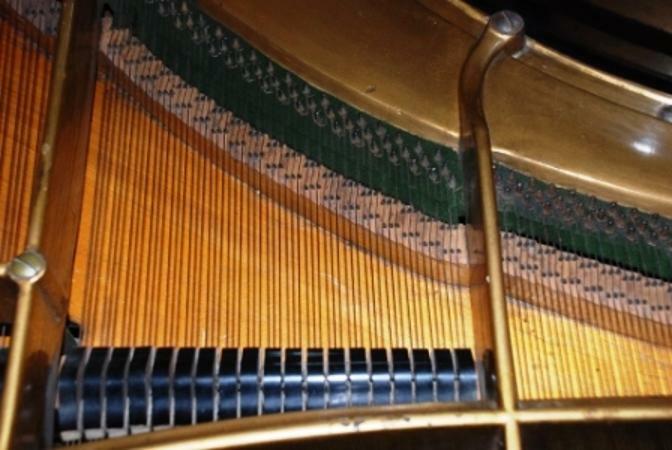 Piano owners wonder how they might clean the soundboard, since it's mostly inaccessible beneath the strings. Actually, DIY soundboard cleaning isn't practical at all. 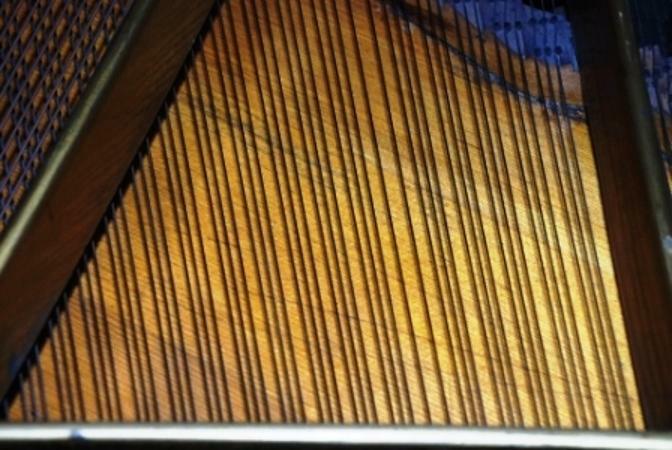 It requires getting a cloth under the strings onto the soundboard, and finding a way to manipulate it. And to gain proper access, you really need to remove the lid from the piano. That's not easy, as the hinge pins have to be taken out and the lid is heavy and unwieldy. Grand piano soundboard cleaning really has to be undertaken by the piano technician using the proper implements and techniques. At the bottom of the picture are two of the Flexible Soundboard Steel tools traditionally used. 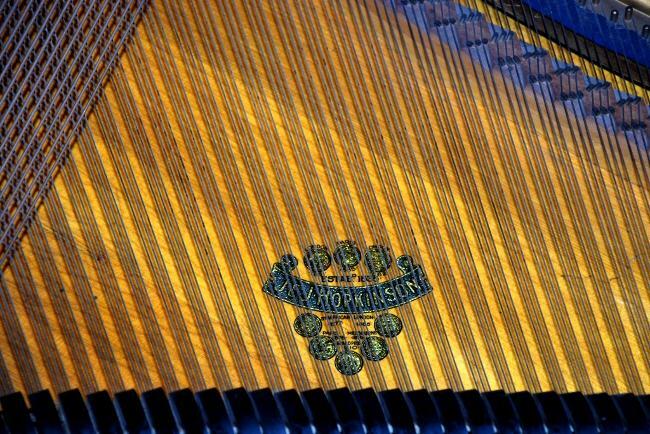 These are thin, flexible strips of spring steel for pushing a cloth around under the strings, by inserting the steel between the strings. Above these is the excellent set of three soundboard cleaning tools manufactured by Bill Spurlock. These also fit between the strings, and can push a cloth around, or if the soundboard only has a very light covering of dust, they can be used as dust collectors themselves (the spade ends are covered in a special cloth material). A big improvement. There's a limit though, to what can be done with the strings in place. 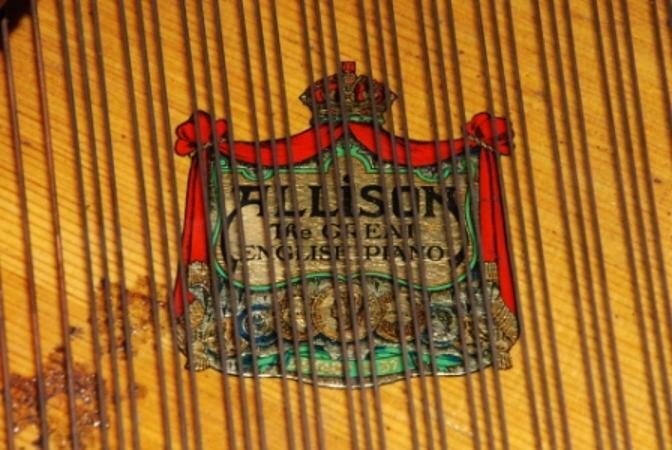 A splodge of something just to the lower left of the Allison label had dried to the consistency of rock-hard varnish, and simply couldn't be removed without damaging the finish on the soundboard. Careful attempts to remove this matter using various solvents were unsuccessful, so it seemed best to leave well alone rather than risk damage. 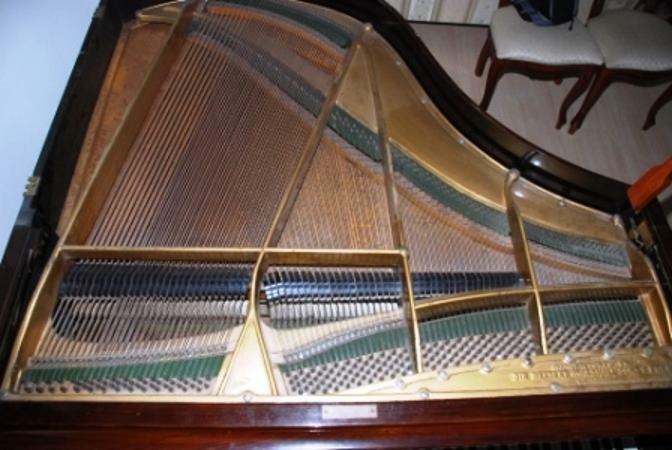 The appearance of the piano was very much improved by the cleaning in any case. 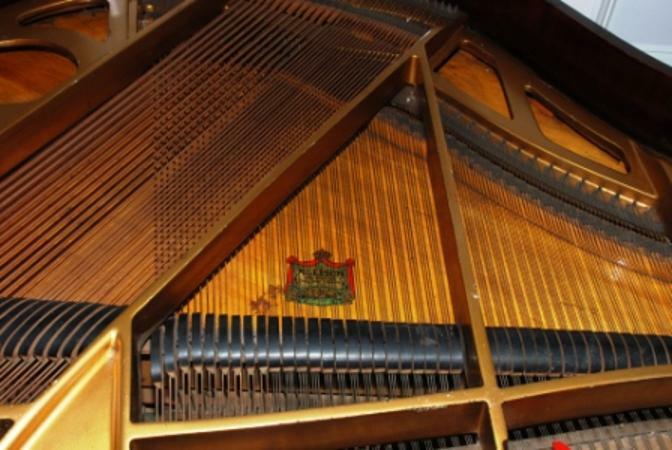 In a top quality piano undergoing a full restoration with re-stringing, the soundboard would be cleaned - possibly stripped back to bare wood and refinished - with all the strings off. Because cleaning the soundboard is a fiddly job it takes time, so the technician has to charge accordingly. The pair of photos below shows the soundboard of a fairly new Yamaha in a school before and after cleaning. 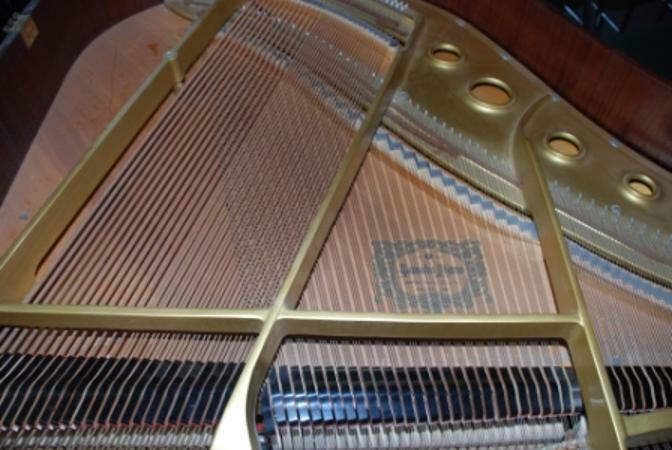 Some items have appeared for sale online described as piano soundboard cleaners, with the suggestion that piano owners can clean the soundboard themselves. 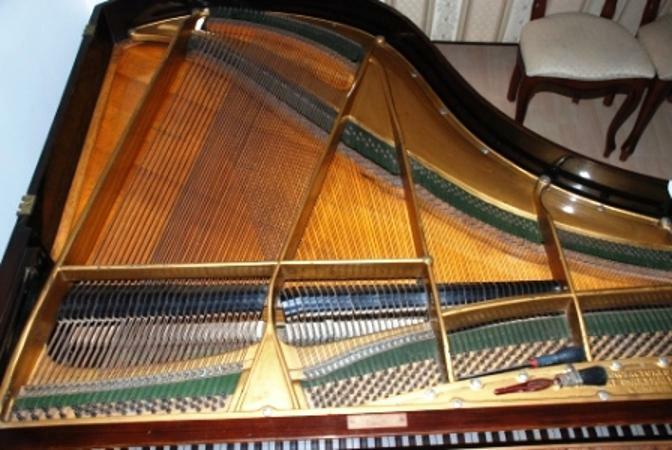 If you search for Grand Piano Soundboard Cleaner on Youtube for example, you will find video clips showing such implements in use. Firstly, we might note that they have a fairly hefty price tag. 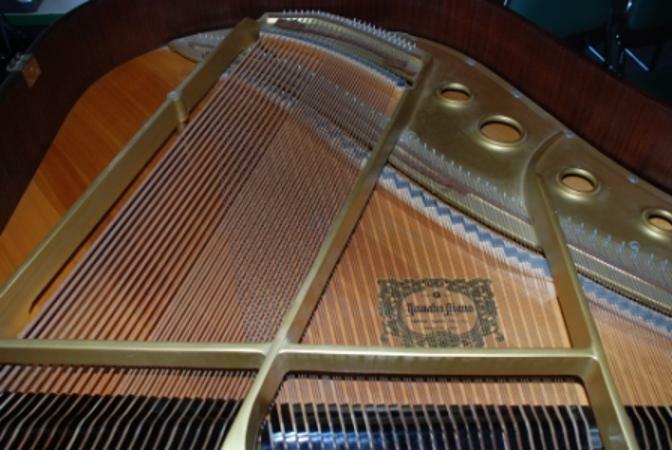 A second aspect is that only a very short grand piano is shown. 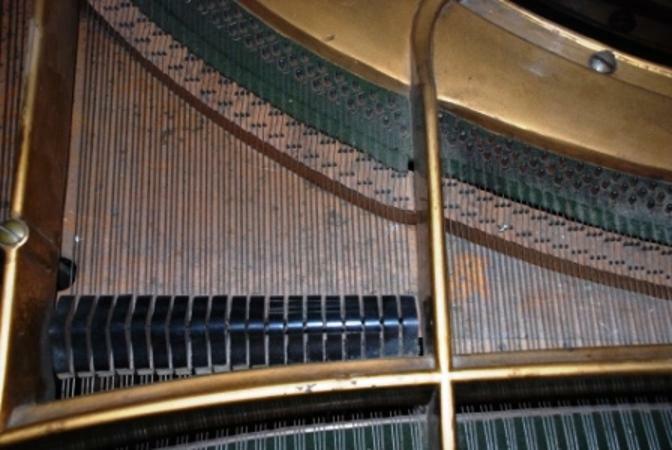 In online photos of this and similar items being used on larger grands, the lid of the grand piano has been removed. 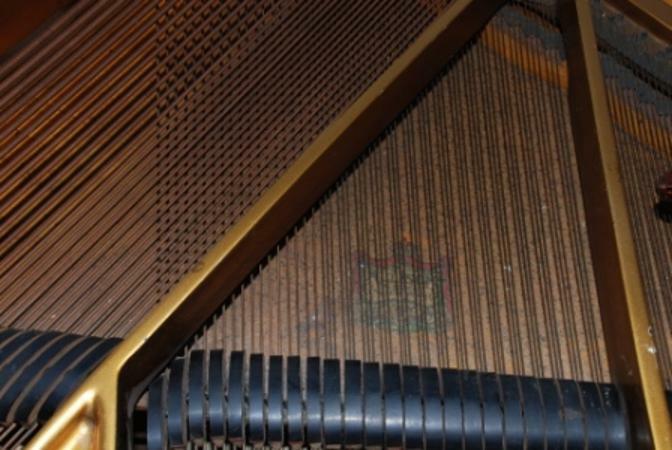 It's necessary to remove the lid so that the "duster on a flexible stick" device can be pushed under the strings from the piano's straight side. Removing the lid of the piano is not easy. The hinge pins have to be taken out and the lid - very heavy and awkward - then lifted carefully away. It's not a task for one person. A third consideration is that these long flexible-stick type dusters are not very good for accessing the tricky nooks and crannies. In the Youtube video, the long straight stick is not shown following the curve of the bridge, although with more care it could have done. But what about the area between the backs of the bridges and the edge of the piano? Nobody shows you how that can get cleaned with a long stick, because it can't! The fourth observation is that such flexible-stick cleaners, used as shown in photos and videos, are useless for anything but light dusting. It isn't possible to clean a really grubby soundboard with them. As you know, to clean a truly grimy surface (and many old grand soundboards are filthy with soot from smokey chimneys etc) you have to apply some pressure with a damp cloth - not just lightly swipe a duster over the surface. What about do-it-yourself soundboard cleaning gizmos then? 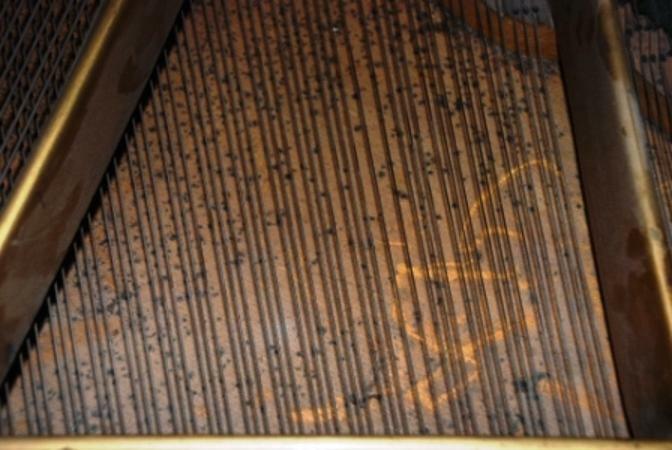 If you are willing to afford them, accepting that they are only good for light dusting rather than actually cleaning, that they can't 'get the corners', and that using them is difficult without removing the lid of the piano, then you might like to have one just for light 'maintenance' dusting. 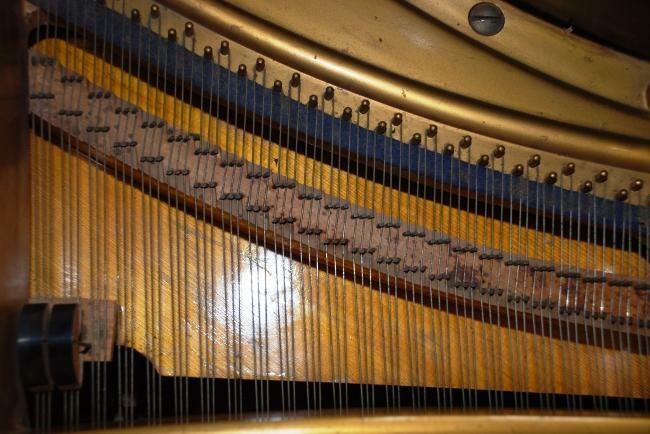 But if your piano's soundboard really needs cleaning, you need to ask your piano technician to do it. 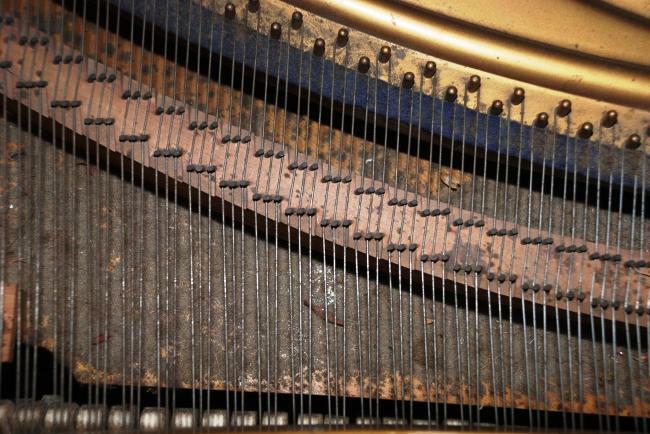 Here are some before and after photos of an older piano with a rather grimy soundboard. Cleaning a soundboard like this takes about as long as a tuning. Soundboard cleaning makes a huge difference visually. But it's also sensible for health reasons - a filthy soundboard is unhygenic. Of course, cleaning can't restore the surface varnish if it's become degraded or marked. 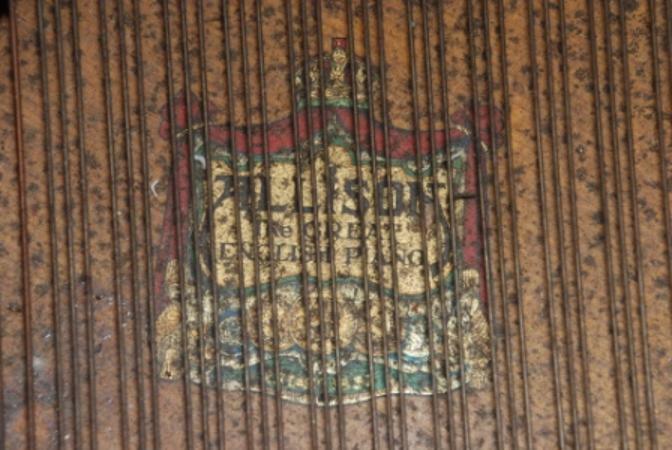 Some marks can be seen in the cleaned soundboard here, ingrained in areas where the finish (generally either thin french polish, or 'white' varnish) has cracked slightly. However, the overall improvement makes the job still very worthwhile. (The marks in the 'before' photo are where a pencil or something had been dropped and retrieved, disturbing the dust). Another soundboard cleaning; a 1930s Hopkinson. Eighty years of grime can't be removed by a light dusting. 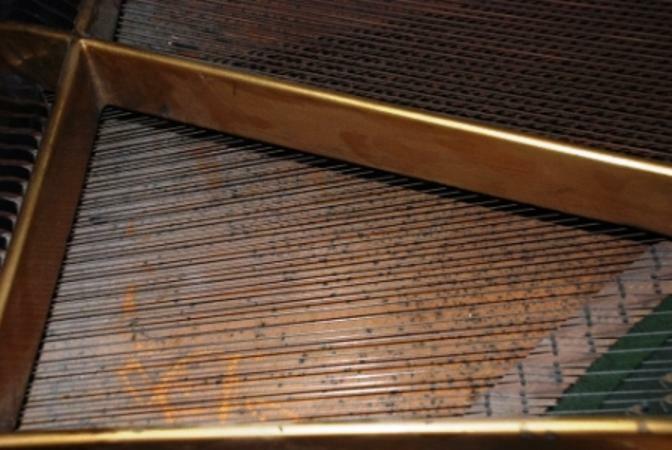 Contact me on 07714959806 to have your piano soundboard properly cleaned.